Mbali is a member of our Girls LitClub in Makulele Village, South Africa in partnership with the Sharing to Learn Organization. Here is her photo showing our team member Denise her report card! We admire her pursuit for her potential, and her best self. 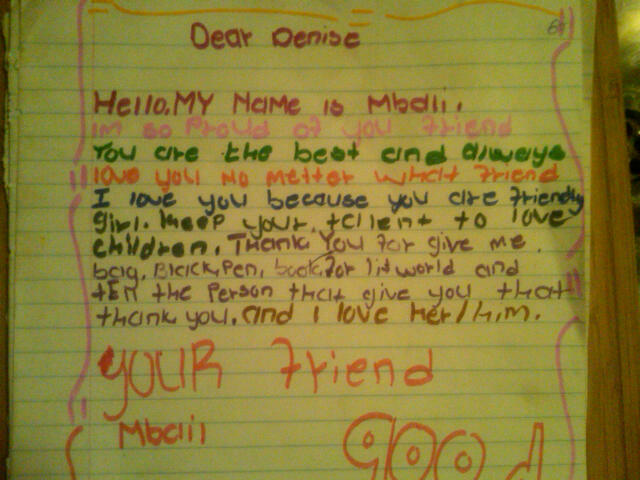 We also included her sweet note showing her appreciation for Denise's kindness and presence. Thank you Denise, for the love you share with all those you meet! Kateko, Age 9, is a new proud member of the LitWorld Makuleke Girls LitClub in South Africa. She dreams of being a teacher when she is older. Denise Ortiz, a member of the LitWorld Leadership Team, has been in South Africa for the past few weekssetting up new LitWorld Girls LitClubs in partnership with her organization, Sharing to Learn. A non-profit based out of New York, Sharing to Learn strives to empower communities through education. She does amazing, powerful work, and we are proud of all that she is doing in the Makuleke Village in South Afrca!